I’m babysitting tonight. A dear friend, who just had her third little girl, is experiencing some complications and her doctor thought it best she go to the hospital. Just as I was putting together the dinner I’d planned to bring her family, her husband called to tell me there had been a change of plans. So, the girls–who I’ve been babysitting for the past few months during their mom’s OB appointments–came to my house while I finished cooking and their parents (and new baby sister) went to the hospital. 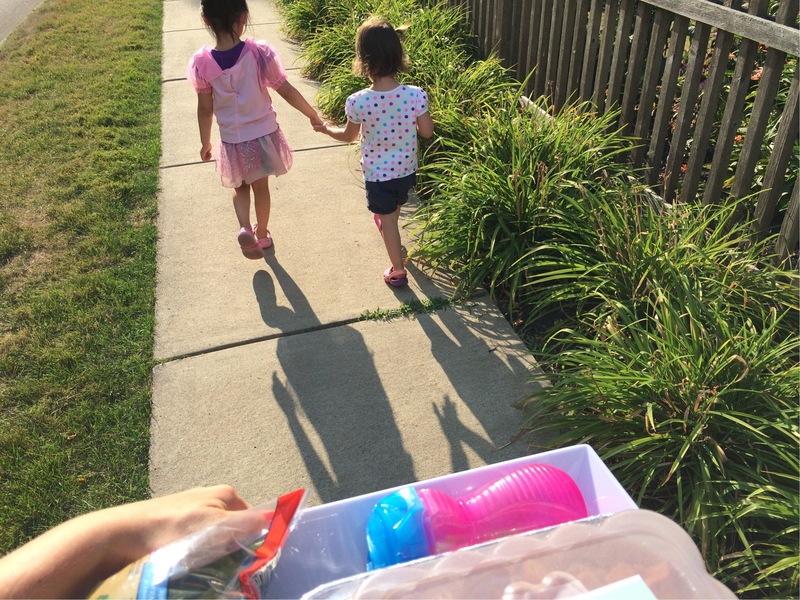 Afterward, we walked to their house with the meal on a tray. It’s never taken me quite so long to go just two streets over! In the past four hours, we’ve colored, eaten dinner, listened to Disney music, colored some more, brushed teeth and read a bedtime story. They’ve only gotten out of bed once so far…and all seems quiet at the moment. Thank you, Jesus, that I was home and able to watch over these little princesses while their parents are dealing with bigger things. Thank you, Jesus, for these little girls, who teach me just as much as I try to teach them. Thank you for their bright little minds, their playfulness and their enthusiastic spirits. Thank you, Jesus, for having us all right where you want us–in a hospital, in their beds, on a friend’s couch–this night. Next Next post: I got a (real) job! !